First of all, let us express to you our sincere gratitude and recognition for the fact that you have chosen our product to achieve your business goals. It shows us that all we do while creation of a monitoring program is not for nothing. The past year has brought a lot of new in the world of business, and we have tried to follow all the new trends and introduced a lot of new and useful tools in our app. Especially it concerns the strengthening of the protection of your data. The year of 2016 became really difficult for small and medium-sized businesses. Large corporations also faced a number of challenges and the need to have attended the introduction of additional security information and staff control. We hope that our service to help you in this difficult question and promise that in 2017 we’ll make it even more convenient and efficient. We were very pleased to receive your letters of gratitude with description of problems which our app helps to solve. We know how it hard for the leaders to keep up with each employee and to react in time to suspicious offense. That why your use cases are so important for us to see, thanks to them we can significantly improve functionality of StaffCounter service. Your opinion and your experience are very important to us! In the end, we want to congratulate you with Christmas and New Year and wish you a productive work, a growing business, reliable partners and the most responsible employees! Let’s overcome the crisis together! 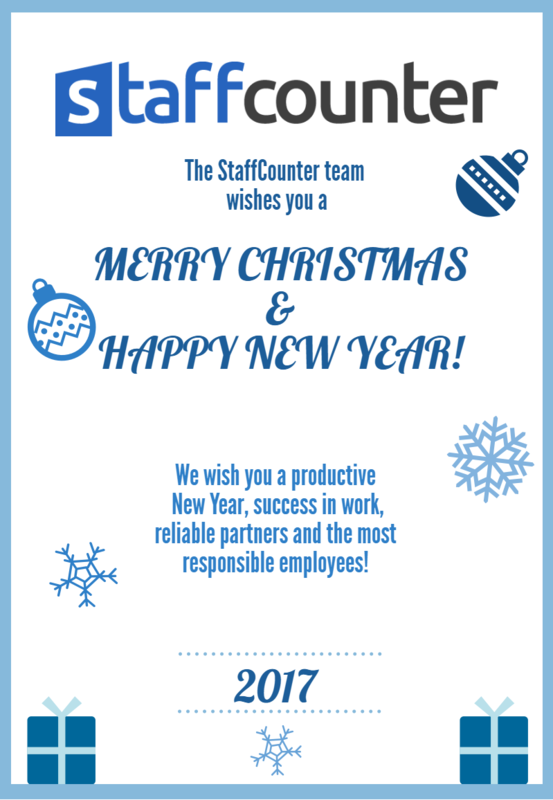 Dear users of StaffCounter system and newcomers, we have great news for you! We know how hard for small businesses in crisis. However, we really want your business grow up and prosper. So we decided to help you to overcome the crisis and minimize the price of our product! Since early April, the price of StaffCounter Pro package will be only $1 per month per employee! This advantageous offer is not going to hit your pocket, but it will help to improve staff efficiency and increase the productivity of each employee. Purchase a package StaffCounter Pro for $1 and get full analytics employee, whose work is directly connected with computers.